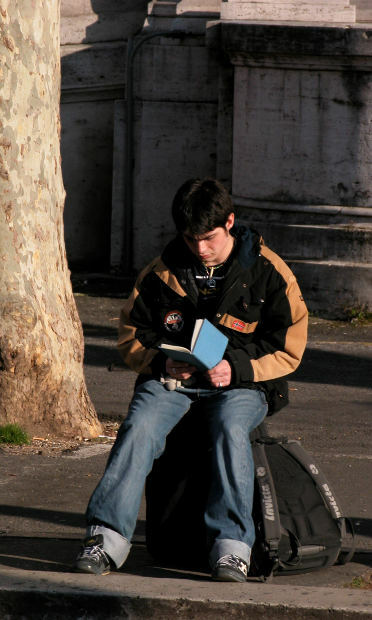 This guy reminds me of me; I’ll read anyplace, anywhere, anytime! Image courtesy of Darnok, Morguefile. It’s funny where the Internet will lead you with only a couple of clicks. I was looking up humorist James Thurber earlier and clicked on a link that led me to a fun website called Brainy Quote. This website has lots of great quotes by the famous and not-so-famous. To get everybody’s Labor Day weekend started on an entertaining note, here’s some of the best quotes that I found about books, writers and writing. Groucho Marx — I find television very educating. Everytime somebody turns on the set, I go into the other room and read a book. Neil Gaiman — You get ideas from daydreaming. You get ideas from being bored. You get ideas all the time. The only difference between writers and other people is that we notice when we’re doing it. Henry Rollins — I’ve always seen it as the role of an artist to drag his inside out, give the audience all you’ve got. Writers, actors, singers, all good artists do the same. It isn’t supposed to be easy. Toni Morrison — The ability of writers to imagine what is not the self, to familiarize the strange and mystify the familiar, is the test of their power. Beverly Cleary — Writers are good at plucking out what they need here and there. C.S. Lewis — You can’t get a cup of tea big enough or a book long enough to suit me. Madeleine L’Engle — You have to write the book that wants to be written. And if the book will be too difficult for grown-ups, then you write it for children. Salman Rushdie — A book is a version of the world. If you do not like it, ignore it or offer your own version in return. Steven Wright — I’m writing a book. I’ve got the page numbers done. W. Somerset Maugham — There are three rules for writing a novel. Unfortunately, nobody knows what they are. Alexander Pope — True ease in writing comes from art, not chance, as those who move easiest have learned to dance. And my personal favorite (maybe I’ll get this put on a T-shirt or sweatshirt!) by Maynard James Keenan — For me, life is writing and I can do it anywhere. It doesn’t matter where I am. I listen. I write. I live.